I've always been a loner (some might call me a hermit). When I travel, I like to get away from the crowds and the noise and enjoy nature. That's why, back when I lived in Atlanta, I wanted a place where I could enjoy myself and not have to drive too long to get there. There are many great places in north Georgia and western North Carolina, and eventually I found the place I loved - Murphy, NC. Murphy is located in the southwestern corner of North Carolina and is convenient to Chattanooga, Knoxville, Asheville, and Atlanta - all of which are about a two-hour drive from Murphy. Murphy is surrounded by a national forest and is a very rural location. Two things really caught my attention and kept me coming back to Murphy. There is a national forest campground, Hanging Dog, right on the shore of Lake Hiwassee, just north of Murphy. I camped there many times. I loved paddling around the lake in my canoe and spent a lot of time fishing and watching the wildlife on the shore. I loved canoeing and Murphy is located about an hour away from two great whitewater rivers. 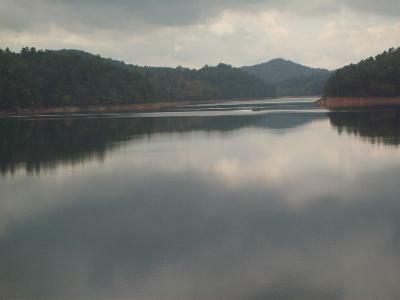 The Ocoee River is just west of Murphy, and the Nantahala River is just to the east. So, when I got tired of paddling in the lake, I could quickly be riding the whitewater on one of those rivers. I enjoy hiking, and there are many trails for the hiker in and around Murphy. One of the most famous, the Appalachian Trail, crosses the Nantahala River and is less than an hour away from Murphy. So, every time I got the chance, I'd load my canoe and camping equipment and head to the mountains. Usually, I'd camp, but sometimes I'd feel lazy and rent a motel room. The other thing that kept drawing me back was the John C. Campbell Folk School that is located about 12 miles from Murphy. They teach a variety of arts and crafts classes that are designed just for the experience of learning, not for getting graded or competing with your fellow students. For many years, I made the trip from the Atlanta area to Murphy. I smiled all the way to the mountains, but found that I was smiling less when I returned to my home and work in Atlanta. When Mom and Pop retired, they bought a house just three miles from Hanging Dog Campground and lived there the rest of their lives. As soon as I could manage it, about ten years later, I moved to Murphy. Right now, I'm typing this in their old home and I plan to stay here the rest of my life. I wasn't born in Murphy and I didn't grow up here, but I moved here as soon as I was able. It's not for everyone. There is no big city excitement, but there is peace and quiet, friendly neighbors, lots of beautiful scenery, and a mild climate that isn't too cold in the winter nor too hot in the summer. I love living here in these mountains. Join in and write your own page! It's easy to do. How? Simply click here to return to Your Favorite Travel Destinations.